Pendragon Theatre presents Steven Dietz's FICTION. Summary: Fiction by Steven Dietz opens up the world of successful writers Linda and Michael Waterman. When a diagnosis upends their safe haven, the pages of their journals and diaries makes each question what they really know about each other. The past and present merge while trust and treachery play hand in hand in unexpected twists and turns. 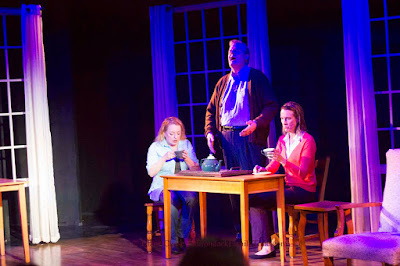 (Saranac Lake) Steven Dietz’s FICTION takes the Pendragon Theatre stage by storm in its opening summer production and Patron’s Pick. Director Allison Studdiford brings this ensemble cast of three together for an elaborate shell game of truth and fiction. 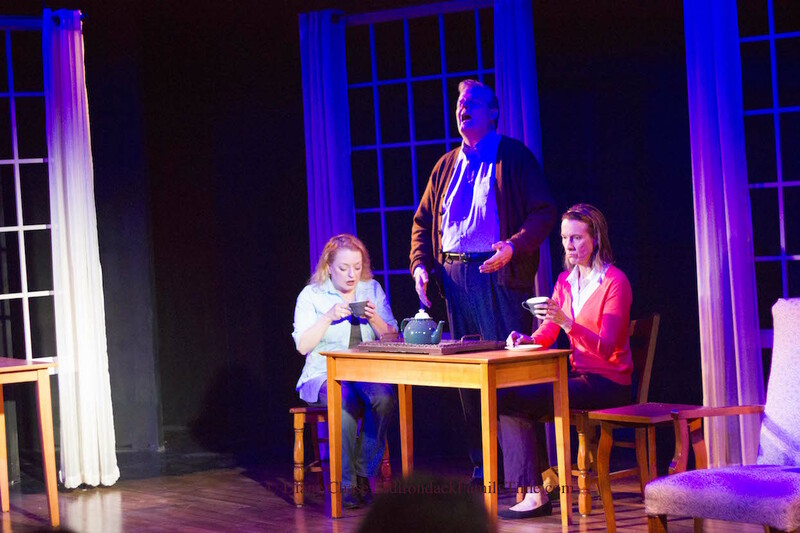 The play weaves between past and present as the audience learns how Michael Waterman, now a popular writer and his wife Linda, a college professor, met at a Paris café. Michael (John Nicholson) and Linda (Leslie Dame) set the play’s tone from the beginning with a lively debate over the best rock n’ roll vocal performance of all time. The timeline shifts to the present where Linda is teaching a fiction class and using her one published work as the text for her students instead of her husband’s popular “made for the big screen” books. The play is a chess match with each character’s move changing the direction of the game. When Linda receives a terminal diagnosis, she offers her journals for Michael to read when she is gone. Her dying request is that she be able to read Michael’s journals as well. Mary Olin's minimalist scenic design allows the play to easily transition between timelines from a French cafe to the Watermans' living room. It's Kent Barren's lighting which sets the tone. Moonlight glows through sheer curtains strengthening the fluctuating timeline. Blues and purples wash over the actors in moments of melancholy. Kent Streed always brings reality to any performance he is tasked with costuming. He has draped the actors to match their personalities with simple options such as Linda's tightly buttoned sweater or Michael's leather jacket. 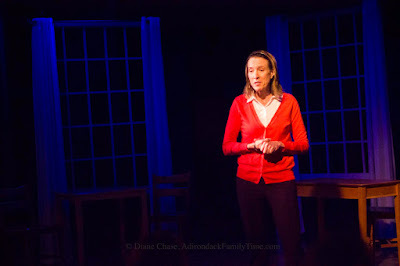 Leslie Dame brings a heart-wrenching performance as the terminal Linda. Dame’s Linda is, on one hand, rigidly academic while lecturing her students or on the other, mournfully stoic as she suggests that a diagnosis should be given in meals left to eat rather than weeks left to live. Later we are even gifted a young joyful Linda just beginning her writing life. When Linda sits to read Michael’s chronologically organized trunk of journals, she specifically chooses the year that he attends a writer’s colony. Drake Colony is also the place where she had attended and finished her one acclaimed novel. 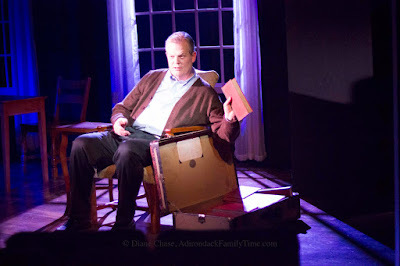 Nicholson’s Michael easily shifts from the present day earnest popular author to a loose-limbed, cocky, unpublished writer as his journal entries come to life on the stage. A love triangle is introduced, but the characters are intertwined on many levels through their relationships and their written words. When Abby Drake (Tara Palen) welcomes him to the writer’s colony, the audience is pulled in one direction. What will be revealed in the diary or what will be assumed? 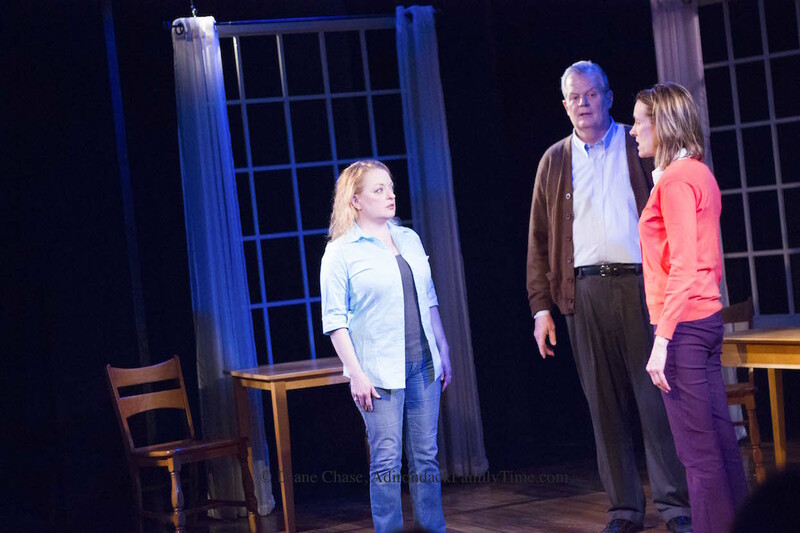 Palen’s Abby is a brilliant addition to the emotionally packed stage. As Linda reads aloud her husband’s diaries, Abby first falls off the journal’s page as stiff and unemotional. Depending on whose journal or memory is being read aloud, Palen easily shifts from damaged girl to intellectual to outrageously funny. Without revealing the whole plot, Studdifield has pulled together a multitalented cast able to pull on our heartstrings. This “push-me-pull-you” play has us questioning from the beginning what journal entries were real and what was just an elaborate work of fiction. in Pendragon Theatre's production of FICTION. The play is recommended for high school students and all adults. Opening Night is tonight, June 16 at 8 pm with a reception to follow. 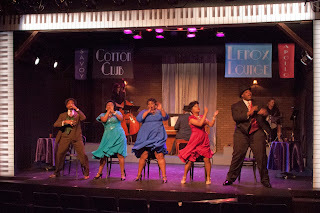 Other performances are June 17, 20, 21, 22, 23 at 8 pm, and June 18, 25 at 2 pm. Tickets are $25/adult, $22/senior, $15/student and all matinees.